This week in New Music: 90s shoegaze act Ride are back with the gorgeous single “Home is a Feeling,” 80s/90s-leaning indie rock with no twist from Communions, The Orwells are not Terrible Human Beings they’re just very naughty boys and Xiu Xiu (above) follow up their Twin Peaks tribute album with the cryptic Forever. When promised a follow-up to Ride‘s 1996 album Tarantula, those old enough to remember how fantastic they were may have been apprehensive at best. What could a bunch of middle aged men have to say and how could they improve on albums like 1990’s classic Ride. Happily, based on earlier track “Charm Assault” and “Home is a Feeling,” the lads haven’t lost it. This, indie kids, is how you do it. 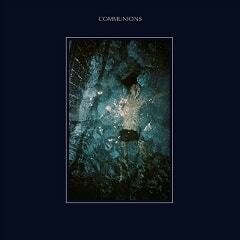 Communions is an indie pop/rock outfit from Copenhagen, Denmark. Their debut album Blue holds no great surprises but if you like your rock wispy with a hint of summer via 80s nostalgia you can’t go far wrong. Although the band would appear to be aiming for Strokes credibility, songs like “Passed You By” and “Got To Be Free” verge on straight out 80s pop acts like Deacon Blue whereas “Don’t Hold Anything Back” and “It’s Like Air” are clear rip offs of Oasis. Which is fine really because Oasis were a rip off of the entire history of rock. That’s possibly the point with bands like Communions – indie pop/rock has been done to death and there’s really nothing new to say. However, the Danish quartet have a knack for keeping it light and while the album is never, ever clever it’s an earworm from first listen. And as if to prove that bands like Communions can be successful despite having nothing new to say while saying it prettily we have Terrible Human Beings, the third album from Chicago-based indie rock wannabe bad boys The Orwells. As with Communions, The Orwells wear their influences heavily and without irony but more Weezer than Oasis. “Good boys come in last/Bad girl by my side/Poppin’ pills on the fly/Cold grave when I die” they sing on “They Put a Body in the Bayou” and that sums it up. 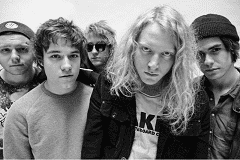 The Orwells seem to think they are indie rock gods who could well throw a television from a hotel bedroom window if they had one too many Coors Lights but listening to Terrible Human Beings you know they won’t really because mom might find out. The Orwells are significantly more successful than Communions for no other reason than luck and marketing. If either band gets featured by Zane Lowe on Apple Music they’ll be huge. Album highlight – “Black Francis” because Black Francis would be proud. Following on from last year’s excellent and timely tribute album Plays the Music of Twin Peaks, Xiu Xiu (above) return with Forget which in many ways seems to be a distillation of the band’s concerns over the last two decades. For the uninitiated, Xiu Xiu do what the hell they want and it tends to be loud, obsessive, glitchy and experimental. On Forget think Brian Ferry on crack with David Byrne in the background trying to calm frontman Jamie Stewart down. Be warned – Xiu Xiu are not for everyone and some might be offended by some of Stewart’s lyrics but if you want something completely different and generally fancy a touch of of Montreal or Joan of Arc give it a go and prepare to be mesmerized by the sheer audacity of it all.